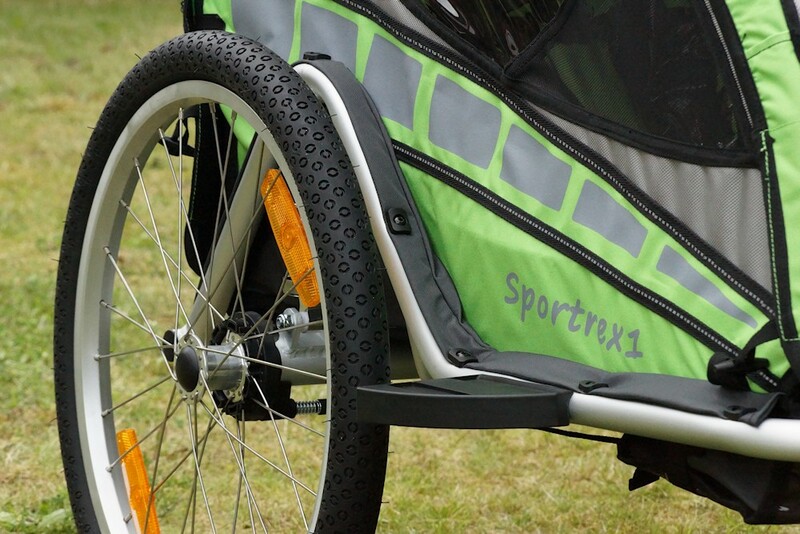 Qeridoo has several child carrier at the moment of Sportrex 1 is designed for a child and can be retrofitted with accessories to a buggy and a jogger. In Qeridoo Sportrex 1 test, we look at the handling, assembly, handling in everyday life, as well as the processing and expansion options. The price of the child carrier at the time of the test: 366 Euro. the Sportrex 1 was delivered in a very large box with Qeridoo imprint. Like other bicycle trailer, this model was brought to the front door. In a small car you get the package probably stowed with much Tetris experience. Included are the Sportrex 1 itself, a stroller wheel, a flag, stabilizers, a sliding handle, wheels, a headrest or a headrest and two protective wedges and spacers. Of course, including also there, a user guide. Assembly instructions. Tool was not included in the package, read more in the assembly. Cardboard, bicycle trailer out, finished. All components have been in the folded trailer. This we have learned from the protector and could take out of the trailer tires. In the trailer we have another box found open this, we looked at the buggy wheel, the head cushion, the part of the trailer hitch is mounted on the bicycle and the two wedges. Stand behind the child carrier and slowly pull on the outer sides, quickly puts on the passenger compartment. So the sentence could sound in the user manual., Just simply turns up as well in practice. Now gently, but with enough force so far pull until the locking snaps into place on the rear rods. The passenger compartment is. That was pretty easy, and thanks to the manual was not a problem. Next we need to move the stabilizers in the designated pockets. These are aluminum rods without a particular profile, but as long as the trailer. In the side wall is pushed, stabilize it and give a sense of greater security at Seitenaufprällen. When installing the 20 inch wheels the proven hub-squeeze technique is applied. Just the wheels out of the package pick and push the wheel hub with the thumb. 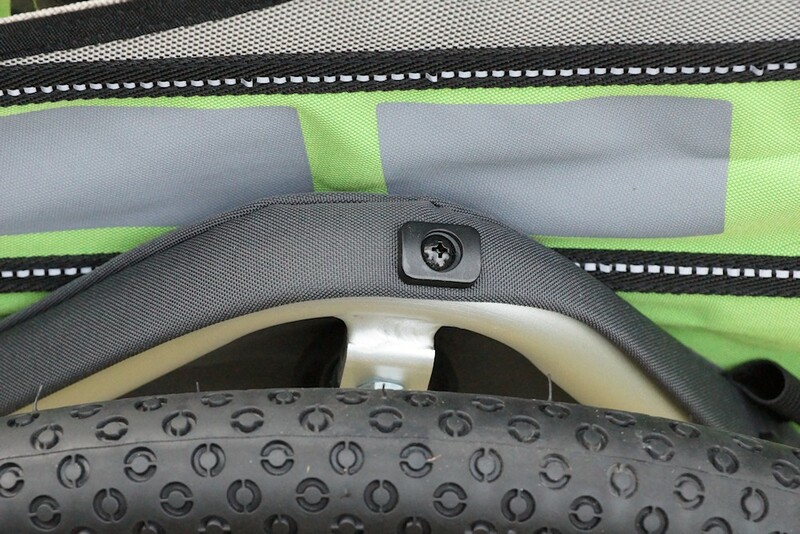 The connected to the axle safety balls draw on in and the wheel can be slid into the holder provided. Leaving aside the pressure on the wheel hub are less, the balls come out again, and the wheel is fixed. Here necessarily test the assembly rational and turn the wheel a trial basis. There should be no play. Until now, we did not need tools for assembly. The two black wedges function as a sort of wing and to protect the tires from damage. As first contact for collisions, the plastic parts take on the most power. The installation of these components was a bit fiddly. Here we need a hexagon socket and ideally a «gun». With not enough space at the bottom of the manual tightening of screws is a little tedious, but doable. Beyond it, «Effect» a lot of time for little. The safety flag is mandatory when driving is required, the manual of Qeridoo. The flag is passed from the outside into a holder provided and can be easily reingesteckt and pulled out again. First, we tilt the child carrier back and look at the underbody. The drawbar is inserted into the drawbar guide and fastened with a screw knob. The drawbar tube here has a 90 ° angle to the trailer and runs almost parallel to the ground in this assembly step. If the screw is inserted through the holes and screwed down, the pole is drawn heavenwards. Now the tiller head pointing to the sky, and the second hole of the guide rail is located just above the second hole in the drawbar. Now the safety pin can be inserted through the second hole and fixed on the other side. Finish the trailer is assembled as a child carrier. On the accessories go a later. If you want to fold the trailer later, solves one cotter pin and fold the tiller just under the trailer. 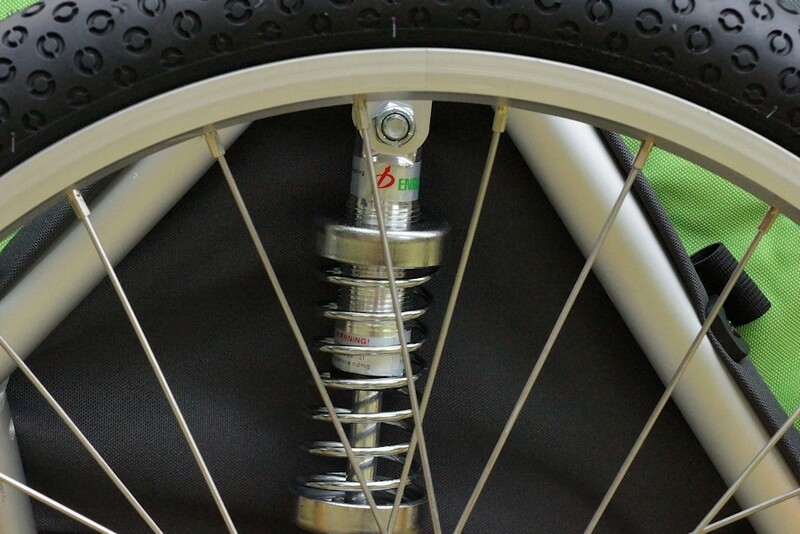 To mount the towbar at the bicycle axle there is an indication that the rear axle you have to exchange and possibly an expert to be brought to the side here. If this is the case, the mounting for the layman ends at this point. The package totaled two coupling pieces for the bike. There can therefore be two bicycles retrofitted for towing a trailer (mom, dad, grandma or grandpa). Furthermore, explains how to assemble the coupling on the bicycle. This is described both quick clamping devices as well as for solid axles. With technical skill assembly as with other manufacturers is made quickly. If you feel unsafe, necessarily ask a specialist. The towbar can remain on the bike after assembly. The processing of different materials are solid at Sportrex 1 and show no optical defects. It can be used for the frame connect, screw and rivet connections. The passenger building is made of fabric (polyester cloth) and plastic film, here see the seams well made from. Does the substance as a metal pipe, the connection is partially fixed with a screw. The Velcro fasteners used close very well and sit above the other. Everything fits as it should and nothing is under unusual stress. Welds make a solid and clean impression. Mosquito nets, sun visor and pockets are sewn all solid. The drawbar and the attachment to the bike are also processed firm and solid. The Qeridoo Sportrex 1 affects overall very valuable. Thus, the trailer can not get out on slopes or inclinations, there is a brake. This is operated with a foot pedal and unlocked. The seat of the foot pedal is back in the middle under the child carrier. Pressing him, goes through a linkage in each case a splint in a drum at 20 inch wheel. The tires are now blocked and can not rotate. As regards safety in the dark, it is in the child carrier producer reflector stripes on the sides, front and back. In addition, two red reflectors at the rear and two white reflectors are installed at the front. In the white reflectors in our opinion, however, a design flaw or logical errors is undermined. The white reflectors are bolted to the front hidden. If you drive with a rolled hood, the reflectors are no longer visible and fulfill no function. This is certainly not as often as before, in the buggy-mode, however, it is quite conceivable that you push only with the closed flyscreen (ZB summer nights). Clear downside. Safety is paramount. The Pennant can be seen from far away already and clarifies other road users to the fact that here follows a vehicle behind the bicycle. What special when it comes to lighting, to be observed when towing a bicycle trailer, we have in the article for bicycle trailer test written. The suspension belongs to us also about security. The child carrier Sportrex 1 has a jump suspension on the axles, which can be adjusted to demand in strength. By suspension roughest roads are balanced, the child gets dampened vibrations from. At the tiller working with a tether, it is known from other bicycle trailers and is a second hedge a must. Still on the subject safety is for us the headrest or the cushion. It is individually adjustable in height and gives the children a head attitude. Sleeping the child while driving a, the head can be held by the side members and does not fly as much back and forth. Also in this child carrier a cloth seat is used. This is suspended at various points in the trailer.The child is strapped with a 5-Punkgurt, Qeridoo are here pointing out that it is in this equipment as in a car seat. The straps are also padded so should an unpleasant pressure can be prevented. All straps can be adjusted to suit the child’s size. The seating area is important safety information be given. So you have this always in mind and can remember before each ride it. Positive, the instructions are also available in German on the polyester fabric. Again, before driving always the child a bicycle helmet and fasten all note the manufacturer’s safety. By adjustable backrest, the seat position can be adjusted. However, this is just before driving and ideally without child bike trailer. For the position of the backrest are two options available. For this, a rod is placed and stretched the fabric seat strapping. The rod is fixed with screws Knauf and can be adjusted without tools. Corresponding holes in the hidden present. The conversion, however, should be carried out without child. 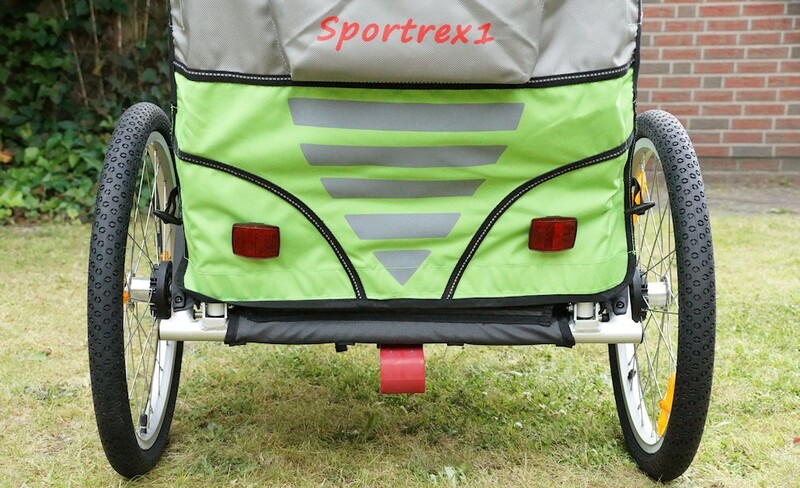 The Sportrex 1 has a few pockets, one is located at the back of the trailer. Here you can reinlegen optimally small things in stroller mode. 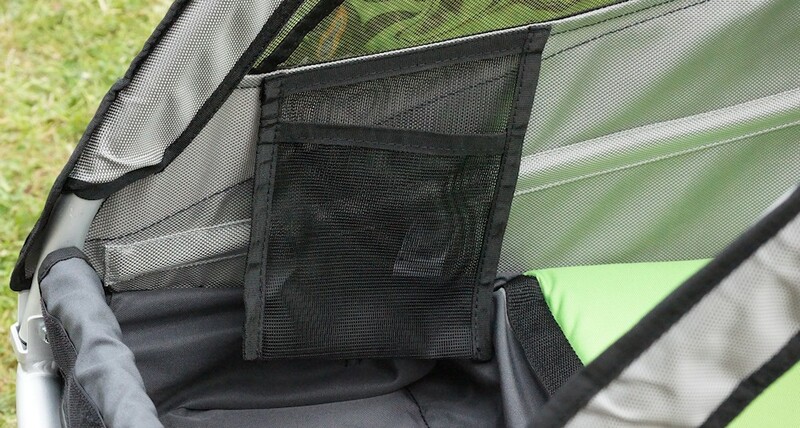 In the passenger compartment there is also a small pocket, a mesh pocket. Perfect for example a bottle reinzustecken for the child. In addition, the trailer in the rear section has a load compartment that here find bags, blankets or smaller purchases a place. 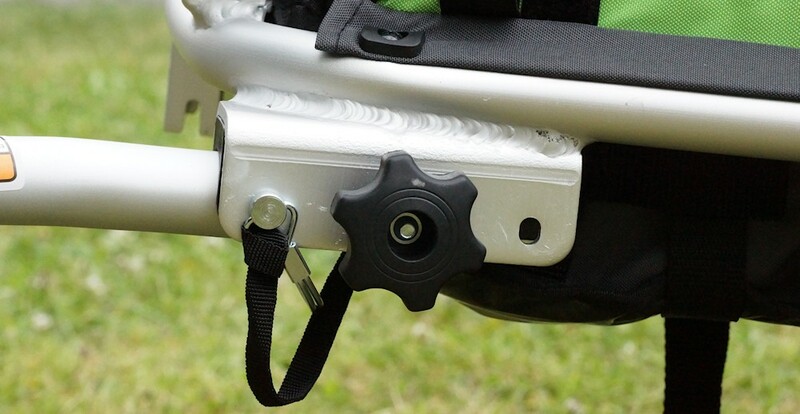 The Buggy Wheel Qeridoo Sportrex 1 can be plugged into a holder on the front of the trailer and secured with a quick-locking device. Moreover, there is a jogger wheel, which is also made for this bracket, but even still has a small tiller forward. And thus more distance than the buggy wheel (8.5 inches). 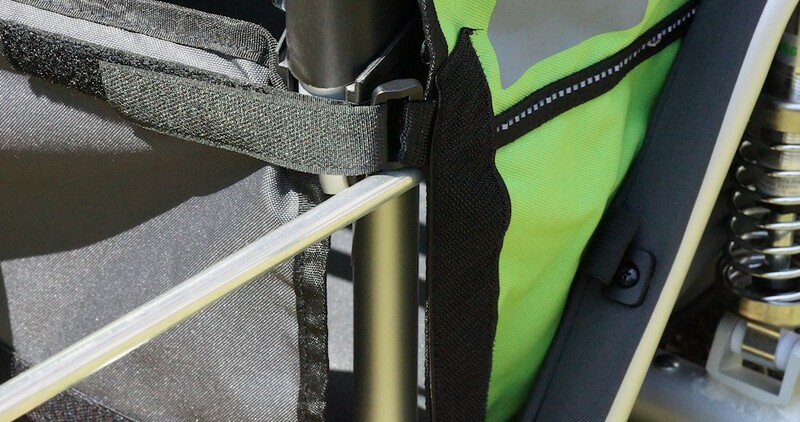 The handle can be easily folded in Jogger operating under the trailer. The buggy wheel can be very easily attached and removed again. In buggy or jogger mode you will also need to handle. 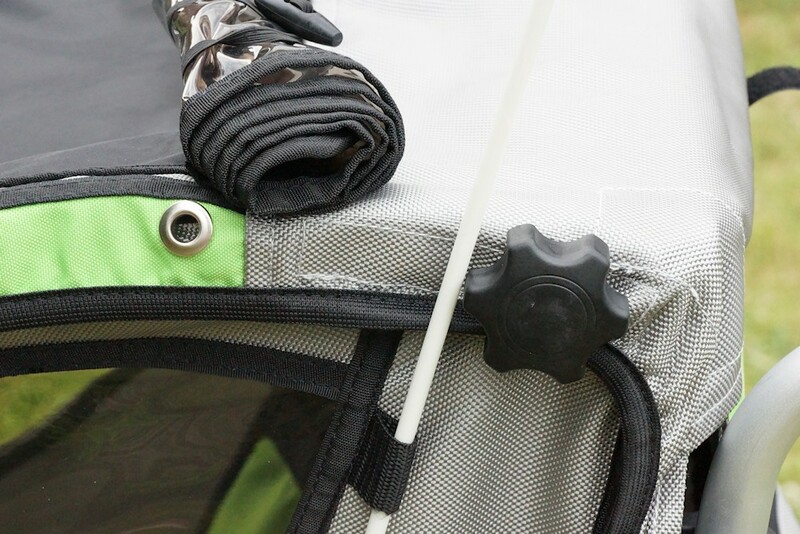 This is attached via knob screws on the back of the child trailer.The handle has an option for adjusting the position, the handle height can be customized to personal needs. The Qeridoo Sportrex 1 weighs about 14 kg. This you realize behind the bike and with our test weight comes neatly train to the rear axle. By suspension on the axes of Sportrex 1 child carrier has a clean running direction behind the wheel and begins to almost non-hopping.Irregularities are leveled out and absorbed by the two tension springs. This gives advantages.The towbar can be other very easily and disconnect again. 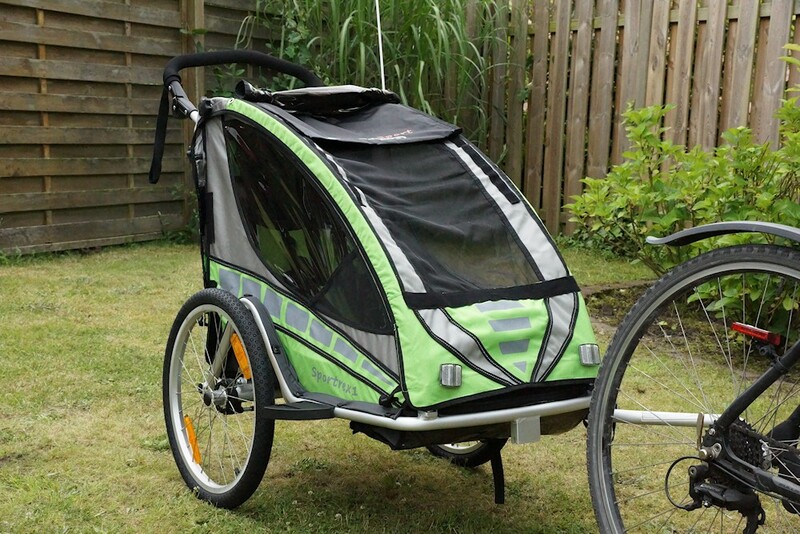 Who buys the Qerdioo Sportrex 1 child carrier, gets a solid and valued bicycle trailer. The manufacturer has been thinking in the processing and planning, a few components are well thought out, such as the sun protection with other manufacturers is an accessory. Here it is included. The Velcro fasteners close very well and are sufficiently available, additional holders are the important and under stress points still available. The brakes working with our Qeridoo Sportrex 1 test perfectly, the trailer is and can no longer be pushed. For the assembly we needed about 30 minutes, so that the trailer is good on average. For 366 euros you get the Qeridoo Sportrex 1 lot on offer. Point deduction there was for white reflectors, these would have to be fitted so that they still retain their function even with the top. Although the manual is available digitally for download, it may not fly apart during the first use. The quality of bookbinding leaves to be desired. Already after 5 minutes we had the first pages in his hand. With a resale makes this a good impression. The manufacturer indicates in the manual that the child carrier has been recognized by the safety standard EN 15918 and was reviewed at CTS International (Center of Testing Service) for harmful substances. Note for Test Procedure: For our test we have for security waived with a child to ride. The testing of borderline situations curbs, traffic lights and narrow streets would have been too risky. Instead, we have placed a weight of 20 kg in the trailer and secured with safety belts. Bike magazine has not tested the child carrier on security or pollutants. The focus of the test is to use in everyday life. For example, point deduction led: The position of the white reflectors, ounting the side wedges. The seat we have tested in the state with a child.